General postings on the blog. Today is apparently the birthday of H.P. Lovecraft, a writer I have loved for many, many years. That has generally been enough. However some very strange events over the last few months are worth noting. First was during my visit to Glastonbury back in June, a trip that turned odd and surprising in many unexpected ways mostly unconnected with this particular avenue. 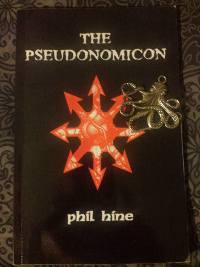 The event in this case was a copy of Phil Hine’s Pseudonomicon falling off the shelf into my hands while trying to get to something else. Its a slim booklet on the use of H.P Lovecraft within chaos magic. I knew I had to have it! Then, perhaps due to the ideas within that booklet I started to see Cthulhu or at least get the impression of Lovecraft in lots of different things, most notably the kids PJs which had a nice blue gothic/steampunk like octopus on them. Looked so much HP inspired that was what I kept seeing. Followed closely by spotting a fun looking Discordian festival which I just kept tabs on as it was far too late to consider arranging a visit this year – maybe next year. Maybe. I don’t know yet. Finally, the last straw (at least in this stage), was my son pointing out a really cool looking octopus on a stall while at Artemis Gathering. That was on the Sunday – eight days ago. Eight. A significant number in CM. Since then I’ve had a number of interesting Cthulhu inspired experiences which I’ve had to write down to get them out of my head. Not sure what this means yet, but appears to be of some significance. Whether I answer the Call of Cthulhu yet is another matter. Certainly open to exploring some more at some point. Several years ago I ventured out into the pagan community searching for fellow Kemetic practitioners or re-constructionists. Luckily, I found a few scattered around the UK and further afield, though depressingly searching for a larger pool I thought there could be groups or organisations that might offer a better chance. Unfortunately apart from some short lived groups (perhaps failing because of the low Kemetic population) there doesn’t appear to be any that offer what I am after. Sure, there are some overseas ones that have UK extensions but they don’t appeal to me due to how they’ve approached Kemetic practice. Of course there have been plenty of general pagan groups and while I’ve really enjoyed those opportunities, the practice of ancient Egyptian magic and it’s approach to deity does not quite align with how much of the pagan community do theirs. This has resulted in some disappointment which is a real shame. All is not lost though. From those who appear to be in a similar situation I’ve been thinking about creating a corner for us local Kemetics to hang out. Now, I may have no success, it may fail like all of the other past groups. On the other hand it might work – we won’t know if we don’t try. If any Kemetics out there – doesn’t matter if you are UK or not I suppose – are interested keep in touch and I will announce things once I’ve sorted out the basics.